International Journal on Computer Science and Engineering (IJCSE) is a leading international journals for publication of new ideas, the state of the art research results and fundamental advances in all aspects of computer science and engineering. 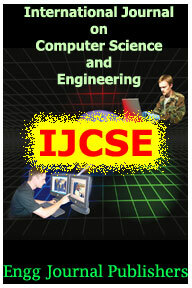 IJCSE is a scholarly open access, peer reviewed(refereed) international journal with a primary objective to provide the academic community and industry for the submission of half of original research and applications related to Computer Science and Engineering. IJCSE welcomes the submission of documents relating to any branch of the Theory of Computing and Engineering and its applications in business, industry and other topics. The topics covered by the journal include artificial intelligence, bioinformatics, computational statistics, database, data mining, financial engineering, hardware systems, imaging engineering, industrial engineering, internet computing, networking, operations research scientific computing, software engineering and its applications. Publication Fees : Rs. 4000 for Indian Authors / US$250 for International Authors.